As far as I am concerned, until recently the most noticeable and most interesting miniatures from Scibor Monstrous Miniatures store were SF Roman Legionaries. But now there are new minis that are similar to Legionaries but are still different, based on another ancient Middle Sea civilization and brought to science fiction reality, SPAAARTAAA ! No other ancient army in history of mankind had been so glorified in popular culture as Spartan warriors, especially the 300 Spartans who died at Thermopile defending Greece against the Persian invasion. Of course, most of what we know from movies, comic books or games is fictitious, but this does not change fact that Sparta and its soldiers were feared and admired by most ancient countries. 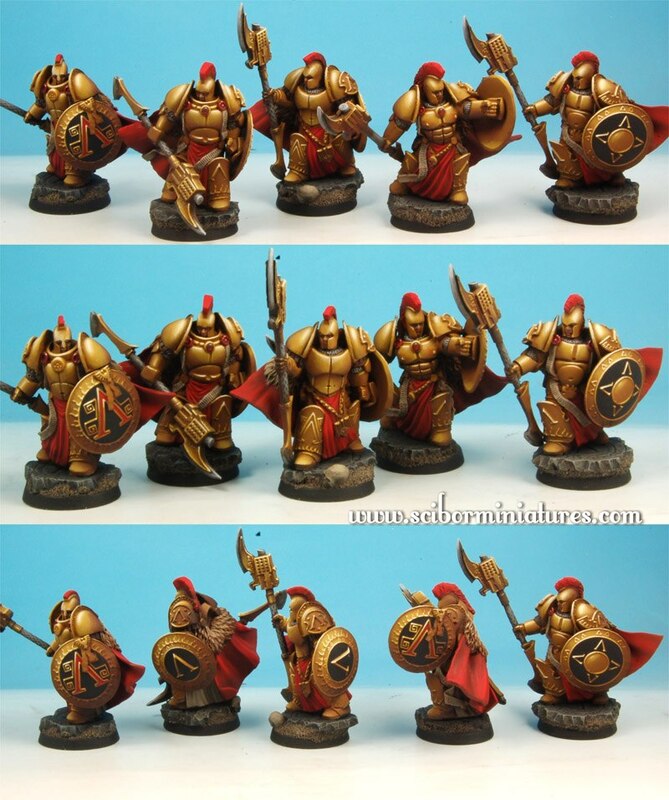 Scibor Spartan miniatures made use that ancient heritage to the fullest. At the first glance the inspiration for the miniatures is apparent. Warriors’ armor and weapons bear clear resemblance to ancient Greek soldiers’ equipment. Breastplate armor is stylized to look like abdominal muscles and its lower part is covered with a robe. Additionally, the breastplate may be adorned with a gemstone or a chain with some small icon. One other thing that is visible at that part of the armor is parchments with wax seals near the armored shoulder pads. Leg armor is relatively plain and simple looking, and the only engravings are those of stylized Greek letter Alpha and solar rays. Shoulder pads are also of simple design. They are smooth and one is adorned with small shield with an eagle or again Alpha letter inside. Their weapons bear strong resemblance to Roman Legionaries’ halberds. The core of the weapon is short and at the rear tip it is ended with small blade. At the top of the halberd there is a range weapon (similar to a bolt gun) added at the bottom of a long blade. There is a mantle with fur falling from the back of all the Spartan miniatures, similar to those you can know from SF Celtic miniatures range. From beneath the mantle there extends a turbine that is a part of the generator that powers up the warrior’s armor. Every model has its own battlebase. Those bases look like more or less seriously damaged block (plate) of marble with a large Alpha letter engraved in the stone surface. 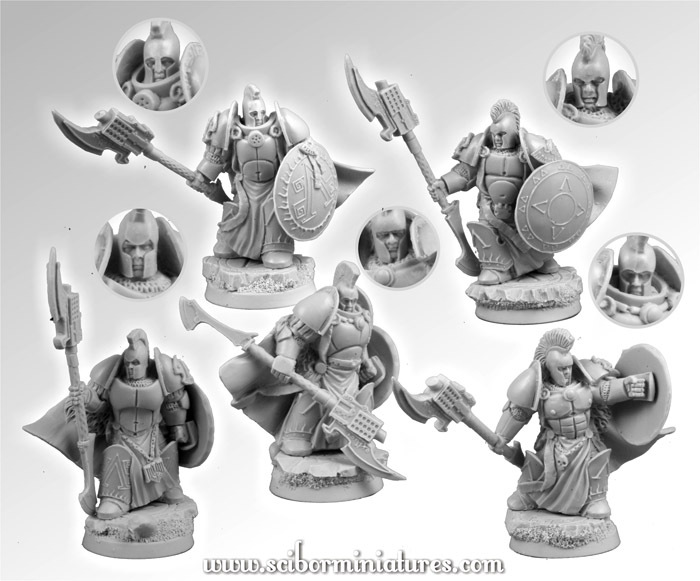 Like all Scibor’s products, Spartan SF miniatures are quite massive and bulky, and the main part of each model is created from one solid block of resin. For me that is not a problem but I know that this technique has many supporters and opponents. 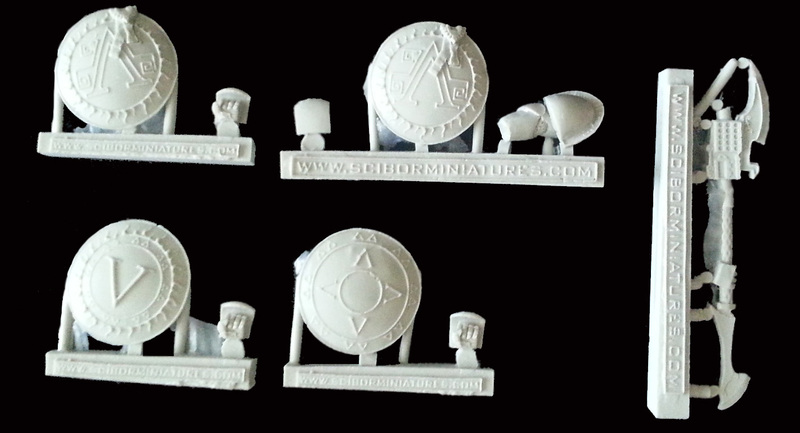 Those minis should satisfy all those who like Scibor Monstrous Miniatures brand. The only drawback in my opinion are slim weapons, halberds can by easily damaged or broken with little force and weapon blade felt little… flimsy.